A while ago I introduced Mindsnacks Spanish app. Now they have a kids vocabulary app with similar game settings. Different from typical ways that English is taught at school, the app groups words by context. The first lesson is all about animal life, so you see the words: omnivore, carnivore, herbivore, fauna, scavenger, voracious. Kids can jump into games right away, or they can choose to take the lesson first. In the lesson, they will see a cute picture illustrating the meaning of each word. They can listen to the pronunciation and read the definition and example sentences. Depending on the word, they can also see the explanation of parts of the words, like ‘Omni’ meaning ‘all’. The games are relatively fast paced. There are 9 different games. All are very engaging. Kids pick the right word for a definition or a definition for a word. It is a fun way to test out how much they know about spelling and definition. It is very nice that after each game, kids can see how well they’ve done, which words they have answered questions correctly, which they have missed. Once they finish one game, they unlock the next one. The app has a total of 25 lessons covering about 350 words. The vocabulary level is perfect for elementary school kids. I like it organizing words by usage, helping kids learn the context when and how to use each word. With the fun addictive games, it totally transforms the boring memorization into fun challenges kids want to come back again and again. 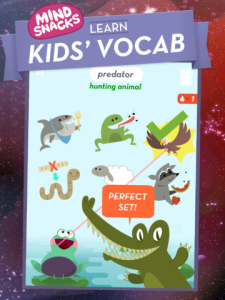 Kids Vocab works on iPhone, iPod, and iPAD. It is free to download, with in-app purchase option to get all the games at once for $4.99.